SDSU NewsCenter’s Video Puts SDSU Comic Arts Collection in the Spotlight! : COMICS ARE EVERYWHERE! SDSU NewsCenter’s Video Puts SDSU Comic Arts Collection in the Spotlight! 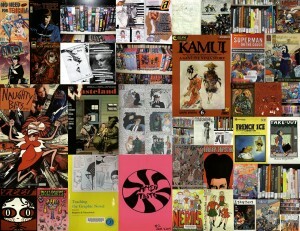 A collage of the eclectic comic-book titles in the archives of the SDSU Comics Art Collection. You might not know that San Diego State University’s Love Library has an amazing comics and graphic novel collection. Yes, you read that right, dear reader. Deep in the belly of Love Library with its countless bookshelves and numerous study rooms, these mild-mannered librarians form a not-so-secret society of devout comic-book advocates who are gradually building an inner sanctum devoted to an impressive range of comic books – including the entire run of “Word Balloons” edited by artist Neil Shigley and myself – in its archives. And this impressive SDSU Comics Art Collection is the focus of a short video providing a quick tour of what the archive has to offer. Think of this roughly three-minute video as a sneak preview of the larger mission driving these everyday champions of comics as a peak in the rise of sequential art. The avengers working behind the scenes in the SDSU Comics Art Collection are cognizant of the rich legacy of the medium. Like all art, comic books are artifacts reflecting the times in which they were made and, therefore, they are worthy of serious study and research. But enough from yours truly. Click the links below to find out more about the motherlode of comic-book gold found in the SDSU Comics Art Collection!